I have got another IIS error message: “Unknown attribute ‘targetFramework'”. It seems to indicate that the site is configured to run under .NET 4 while IIS has been set up to run under an earlier version. 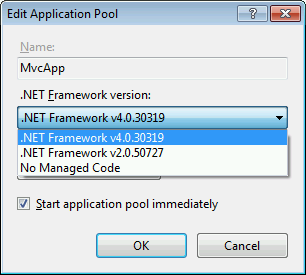 To target .NET 4 in IIS, open the IIS Manager and expand the Application Pools node. Then find the application pool used by your web site, call the context menu and choose “Basic Settings” and then switch the target framework from 2.0 to 4.0. 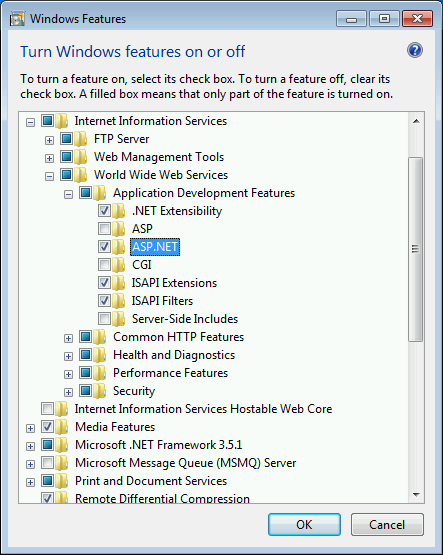 This entry was posted in Uncategorized and tagged asp.net, iis, web deploy on 2011-08-28 by Sergey Brunov. Today I have faced with the “HTTP Error 500.19 – Internal Server Error” after publishing my ASP.NET project. Control Panel -> Program and Features -> Turn Windows Features On or Off -> Internet Information Services -> World Wide Web Services -> Application Development Features -> Check/Uncheck ASP.NET.